On February 3rd, the MPAC is hosting a parent social event & fundraiser, "Curl For A Cause" at Hollyburn Country Club. ​Please join us at 6:30 pm for this fun annual event! ​Tickets are limited and can be purchased HERE. Yoga & Mindfulness Program starts this WEEK! Just a reminder that Yoga & Mindfulness starts this week! This class is now OPEN TO GRADE 3 students! Register HERE! To register for Session 2 you MUST REGISTER onto our new ordering platform HERE. Registering is quick and simple and all instructions can be found on our HOT LUNCH page for more information. Membership Update: Member Resolutions Submissions for The 2018 AGM: We encourage member PACs and DPACs to review the resolution policy if you are submitting a resolution for presentation at the BCCPAC Annual General Meeting (AGM). Please submit your resolutions using the BCCPAC Resolution Form. More information click here. 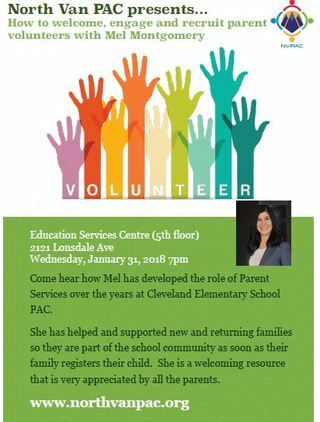 Come and hear about how Mel has been successful at welcoming and engaging new parents at Cleveland. Parents of current grade 7 students across the North Vancouver School District are invited to attend the upcoming Grade 7/8 Parent Information Nights, offered at each secondary school from January to February 2018. At the Parent Information Nights, parents will receive a general overview of the secondary school and have the opportunity to attend an optional parent school tour. Information specific to grade 8 and the transition to secondary school will also be presented during the evening. February 3 PAC Parent Curling Event "Curl for a Cause!" 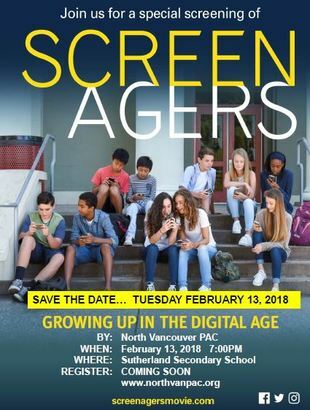 The free screening focuses on growing up in the Digital Age, hosted by NVPAC and facilitated by Jesse Miller of Mediated Reality at Sutherland Secondary from 7-9pm. Click HERE to register (parents & caregivers only).